Doctor Who: The Fan Show - Series 10 Trailer, The Pirate Planet and More! Doctor Who is back this year with a brand new series so we get up to date with the Series 10 trailer and all the latest news and announcements. FiveWhoFans - We're back this month! No FiveWhoFans videos from January as we've had some time off but we'll be back on February 6th with more videos and an exciting new look! Be sure to subscribe to us on YouTube for the latest videos and Twitter and Facebook for announcements and bonus content! "Come on ladies, come and get your tangerines, 6 for a pound, get 'em quick!" Doing "scary hands" with fellow Fan Show host, Luke Spillane. My new best friend, K-9. I was deeply saddened to hear the news of Sir John Hurt's passing. I was lucky enough to meet Sir John Hurt at Gallifrey One in LA last year, he was so lovely. He was a hugely talented actor and an exceptional War Doctor. Farewell, Sir John Hurt and thank you. It was lovely to visit the Doctor Who Experience and stare at the gorgeous console rooms. Sadly it will be closing this year so if you love Doctor Who but haven't been, I highly recommend planning a trip! I've been multiple times over the last three years and there's always something new to look at. For more pics from my trip, see my Instagram. "I don't want to go" - standing in front of my favourite TARDIS console room in 2014, 2015 and 2017. 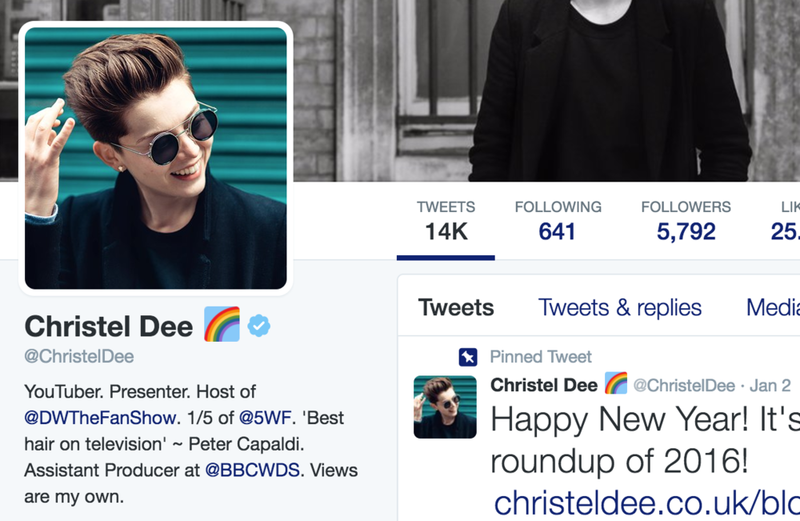 My Twitter account now has a blue tick so you really know it's me! If you're not following already, you can do here. Tens of thousands marched across the UK in response to President Trump's Muslim ban, including myself. My first protest and most definitely not my last. I'll be back at the end of next month for February's roundup. Until then, have a great February!